Working and living in the Perimeter area has become decidedly up-scale. A brilliant, luxury development is bringing a unique level of elegant sophistication and progressive thinking to 10 Perimeter Park Drive. Extending an invitation to you both inside and out you will be struck by the degree of design and planning that touches every detail of 10 Perimeter Park. Classically modern architecture gives way to thoughtfully designed and finely finished contemporary interiors. In creating 10 Perimeter Park, we've worked hard to make it a special living environment - in more ways than one. A special bio-retention riparian zone collects and cleans rainwater runoff before releasing it into the watershed and nearby Nancy Creek. Air conditioners are hidden from view, tucked away where they can't compete with landscaping. A special acoustic glass on windows facing the highway creates such peace and quiet you would never know it's there. 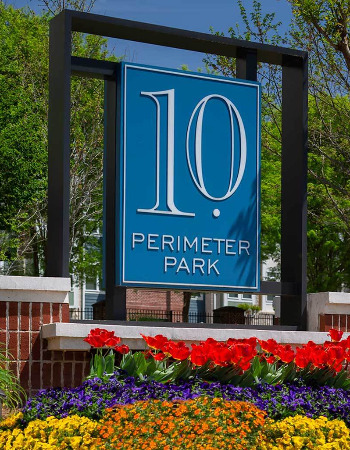 Get your perfect 10 with a 10 Perimeter Park Luxury Apartment Home!